As I head into my mid thirties I have been noticing a few fine lines appear ..... and over the years my skin has slowly changed.....As I attempt to hold back the time of aging by exercising and using various facial creams and serums, I'm always looking best product to help keep my skin youthful......So I was ever so delighted to try FaceD 3-Luronics face cream. FaceD 3-Luronics is the Bestselling Italian face cream and claims wrinkle reduction short and long term with increased luminosity and firmness....Following its Italian launch FaceD 3-Luronics sold out within a week of going on the shelf's in a Milan store. Trails on women have proven long term and short term benefits, By tightening pores, brightening skin, and wrinkles appear less visible. FaceD 3-Luronics underwent 18 months of scientific research into the development and formation the cream has three different molecular weights of hyaluronic acid its higher weight molecules insure that the effects are visible from first application combating signs of tiredness and the super lightweight molecules act deep into the skin to hydrate and revitalise and re-structure the skin over time and is suitable for all skin types ... I cannot wait to get testing. I'm only a two days in and I'm really loving this cream....you can immediately feel the smooth velvety texture on my skin its a fantastic make up base and feels super lightweight and velvety to the touch and my skin feels very hydrated...I cant wait to use FaceD 3-Luronics in my skin care regime over the next few weeks, I will share my overall thoughts in a few weeks time. 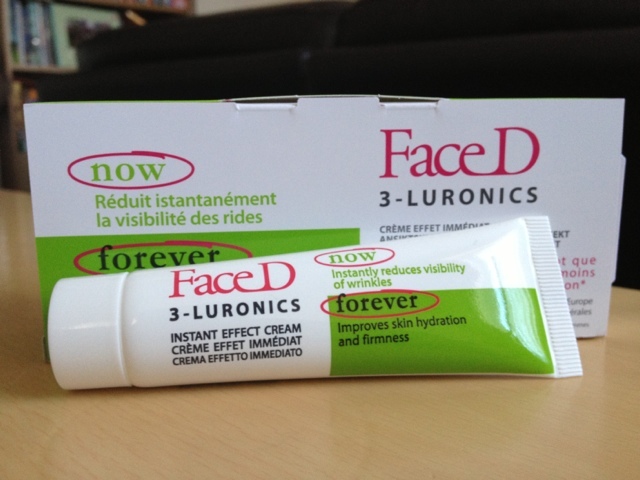 FaceD 3-Luronics is exclusively available at Lloyds Pharmacy. I have been given the FaceD 3-Luronics to review...all thoughts are that of my own and I have not been instructed in what I write.